First wife of Fred “Fritz” Bernard Rohe, married July 2, 1898 in Trinity Lutheran Church, Crete, IL. Injured more than ten days ago in an auto accident while on a tour of the state, Mrs. Fred B. Rohe, wife of the mayor of Crete, died last night in a hospital at Brownsville, Texas. The immediate cause of Mrs. Rohe’s death, according to the report received here, was a second operation to remove the pressure of a fractured skull. The operation proved a complete failure, it was said, and Mrs. Rohe died almost before she could be removed from the operating table. Present at the Brownsville hospital at the time of death were the husband and daughter, Mrs. Paul Monahan, of Crete. Mr. Rohe was slightly hurt in the same crash which caused his wife’s death. The daughter had been summoned to Texas as soon as it was known that the condition of the injured women was serious. For nearly two weeks Mrs. Rohe had waged a constantly losing battle for her life. The skull fracture at first was thought to be slight, and it was hoped that she would survive. But an operation was soon found necessary, and although it proved partially successful, the patient failed to rally. Her condition soon became so critical as to lead to the second operation. The accident which led to the fatal injury happened while Mr. and Mrs. Rohe were passengers in an auto owned and driven by a Chicago friend. As they were approaching the town of Harlingen, another auto is said to have driven suddenly across the highway directly into the path of their machine. A severe collision resulted, and the car in which the Rohes were seated hurtled off the road and overturned. None of the other passengers in the auto was seriously injured, although Mr. Rohe received treatment at the hospital. It was not known here whether the driver of the other car had been apprehended by police. Following an inquest today, Mrs. Rohe’s remains were to be sent to Crete for final rites. The funeral plans were not complete. 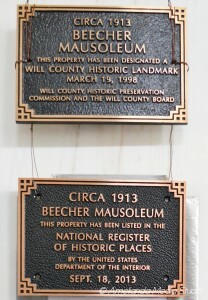 The dead women had been an active member of Trinity Lutheran Church, and it was thought services would be held there. Mrs. Rohe was 55 years old and had lived throughout her life in the village of Crete. 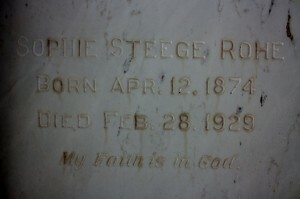 She was the daughter of Mr. and Mrs. Fred Steege. Surviving in addition to the husband and daughter are one son, Otto F. Rohe, of Crete, and two brothers, Herman and Martin Steege, of Chicago. Mrs. Rohe was active in social and club work both in Chicago Heights and in Crete. She was formerly an officer of the Crete Women’s club. Other, more distant family include: Bahlman, Batterman, Bergmeier, Beseke, Bielfeldt, Bohl, Cloidt, Dunlap, Engleking, Fenske, Fick, Fiene, Freerking, Frobose, Graham, Guritz, Hack, Hager, Haltenhof , Heine, Heldt, Hildeman, Hinze, Hoffman, Hoppensteadt, Horn, Hunte, Kaczynski, Kappe, Kilborn, Kirchhoff, Klocksieben, Koch, Langreder, Leder, Maass, Matthias, Mc Carty, Meyer, Monk, Niedert, Ohlendorf, Pansa, Peters, Pralle, Riley, Ristenpart, Rust, Saller, Selk, Struve, Thielman, Vagt, Von Engeln, Wegert, Wehmhoefer, Wiechen, Westphal, Wilkening. This entry was posted in Automated Burial Listing, Burial Listing, Burial Location, HEADSTONE, Obituaries- Have Full Copy, Trinity Lutheran - Crete by Sandra. Bookmark the permalink.